You’ve gotta admit it - visiting a doctor is hardly a pleasurable experience! And if your clinic resembles a gateway to hell, there’s nothing you can do to stop your patients from fleeing! The design of a clinic plays a very important role in ensuring that they remain as calm as possible. 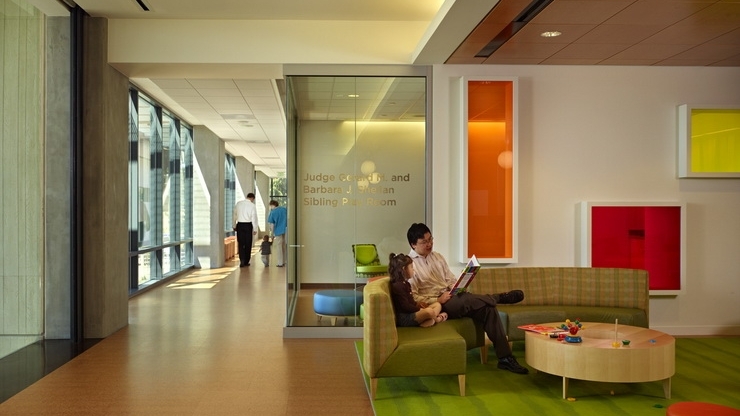 Here are a few ways to design a clinic that immediately puts your patients at ease! And of-course, as always, a visual guide awaits at the end. So if you are in a rush, you can check it out as well. 8 Interior Design Tips For A Doctor’s Clinic That Calms Patients Down! Your focus as a doctor should ideally be on the diagnosis and treatment of your patients. However, the design and ambience of your clinic can help your patients be calm, thus making them more receptive to the treatment you provide. Here are a few ways you can achieve this! The element that is most specific to a doctor’s clinic is customisation. This means that the design and look of your clinic must be directly related to the type of service you provide. For example, a paediatrician's clinic can be brightly coloured and host toys and games while an orthopaedic doctor’s clinic should focus on ease of access at all points within the clinic. A psychiatrist’s office can focus less on the utilitarian aspect and more on the feel of the place. Since the design of a doctor’s clinic is highly dependant on the nature of the work, one must take into account the following factors while designing a clinic. What is the size and the amount of space available? Is there a specialisation for the practice (such as dentistry)? Is the clinic equipment intensive for diagnosis or treatment? The entrance to your clinic is an important aspect that weighs in heavily on the comfort experienced by your patients. A large doorway is advocated so that they can step in comfortably with adequate space for someone who is accompanying them. If it is feasible, the possibility of a ramp or some sort of support system should be considered, especially if there are stairs. It is important to ensure that the entrance is not cramped. Any furniture that reduces the floor space from the entrance to the reception must be removed. If footwear has to be removed, there should be enough provision for placing them. It must also be easily accessible so that even a minimal strain on your patients can be eliminated. A small seating arrangement for removing and wearing back footwear can add more comfort to the entrance. It is possible to make people feel like they are standing on the threshold to a better life by paying adequate attention to the reception area of your clinic. It is wise to leverage on the potential of the first impression to create a sense of being healed. The table or desk and other furniture used in the reception area must be simple, immaculate and sturdy to exhibit dependability. They must also be at a comfortable height so that patients can easily approach your receptionist. Convenient arrangements should be made so that it is easy to fill forms etc. The waiting area is probably the part of your clinic that has the highest potential to put your patients at ease. This is because they are conscious of the seconds ticking here and they actively engage with the surroundings. Seating should be planned in such a way that it there is an optimal balance between comfort, providing personal space and making the best possible use of the space available. The lighting should be bright enough to facilitate operational aspects but not too bright as this can add to the discomfort that patients. Furniture should be accommodative of not only seating but also other aspects such as storing reading material (magazines, newspapers, books), displaying posters and disseminating information. Colour schemes should be relaxed, bright and airy, depending on the type of clinic. Use artwork with soothing colours. Having a few indoor plants also helps keep the environment clean and calming. The equipment in your clinic can be used for diagnosis or for treatment. If space permits, they must be in separate areas of the clinic. During the installation of your equipment, it is important to ensure that their placement is designed in such a way that allows adequate space to walk around and adjust the equipment as and when required. Wires and extensions if any, need to be handled in a neat manner so that people don't trip over them and to give off a clean vibe. There must also be an area where the equipment can be stored when not in use. This is important since it should be safe and away from intense heat and light. Lighting is quite an important aspect of design. It assumes more importance in a doctor's clinic because it has to fulfil two types of purposes - utilitarian as well as creating a visual impact. The lighting in observation or examination rooms and treatment rooms has to be bright. Based on the requirement, focus lights can also be installed. These might be required in a dentist’s office or in an ophthalmology clinic. The lighting in the reception and waiting area can be less bright to evoke a sense of calmness among your patients as they wait. If your clinic is small or there are areas in which multiple services can be provided, you can consider installing lights in which the brightness can be adjusted depending on the requirement at a particular time. It has been proven time and again that colours if used appropriately, can be used to impact the mood of people in a subconscious manner. This can be used by placing emphasis on the colour scheme and the kind of paints used in your clinic. Simple, light and monotonic shades such as white, cream, beige and off-white are neutral options to consider. If you would like to do more, it is best to stick to pastel shades such as light green. This will also focus the patient’s attention on the displays that you put up. Furniture can be coloured in such a way that it contrasts well with the walls and flooring. Dark and uniform shades are recommended to project an image of stability and consistency. Experimenting with colour in a doctor’s clinic can be done on decorative items or artwork. These can be bold but it is not an absolute necessity. A dentist’s or doctor’s office has to comply with strict sanitary and hygiene rules. The floors in these offices have to be cleaned and disinfected frequently, for instance. Preferably, they should also withstand the hustle and bustle of people coming in for their appointments. Opt for flooring that doesn’t get too slippery, especially if your clients are children or older people. Quick Tip: Hardwood flooring works best for a clinic, in terms of durability and aesthetics. Your clinic is a place of healing and a gateway to a better life for your patients. Paying attention to the design of your clinic so as to transform it into a soothing place that can aid in their recovery. For personalised ideas on revamping or designing your clinic, get in touch with Hipcouch right away. Newer Post10 Winning Material Combinations For A Stylish Abode! Older PostTouch It To Believe It - Types Of Fabrics For A Stylish Home!